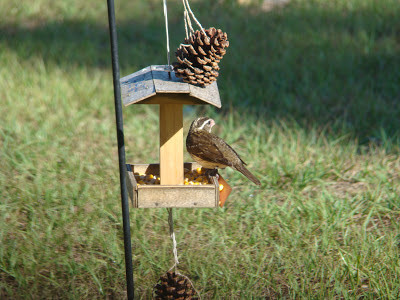 Back last April, when we were experiencing a very fruitful Spring Migration, Heather in Cape Coral was lucky to have this female Rose-breasted Grosbeck visit her feeder. Yesterday I visited Bunche Beach with Bob Pelkey. Arrived on a rising tide and found the usual - Bald Eagles, Osprey, Yellow-crowned Night-heron, Short-billed Dowichers, Spotted Sandpiper, Western Sandpipers, Least Sandpipers, an American Oystercatcher, Laughing Gulls, Royal Terns, Sandwich Terns, Willets, Ruddy Turnstones. What I was hoping for was my first american white pelicans for the year, or an avocet (which i still need for Lee County) or the resident long-billed curlew. Elected to make a quick stop at nearby Harns Marsh to collect a count for the Lee County Bird Patrol. With the weather improving with the arrival of cooler air, this a more enjoyable stroll around the edge of the southeastern corner of the Marsh. Arrived at 8:30 am and immediately spotted a trio of Wild Turkeys working the tree-line across the lake from the parking area and a calling Yellow-throated Warbler could be heard as well. The always present vultures were occupying any spot were they they could warm up, with wings spread out to catch the sun. Water levels remain high with few waders present, but a couple flocks of White Ibis did fly by looking for a good spot for dining. 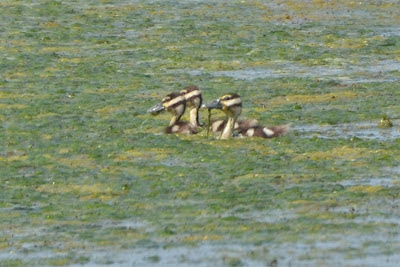 Waterfowl were limited to a couple of dozen Mottled Ducks and about ten newly arrived American Coots. It won't be long and hundreds will be on hand. Soon blue-winged teal will be plentiful too. Only sighted a couple of Limpkins and spotted the first Snail Kite I have seen here in some time. A team of biologist were also here looking for kites and agreed that just the one was seen. 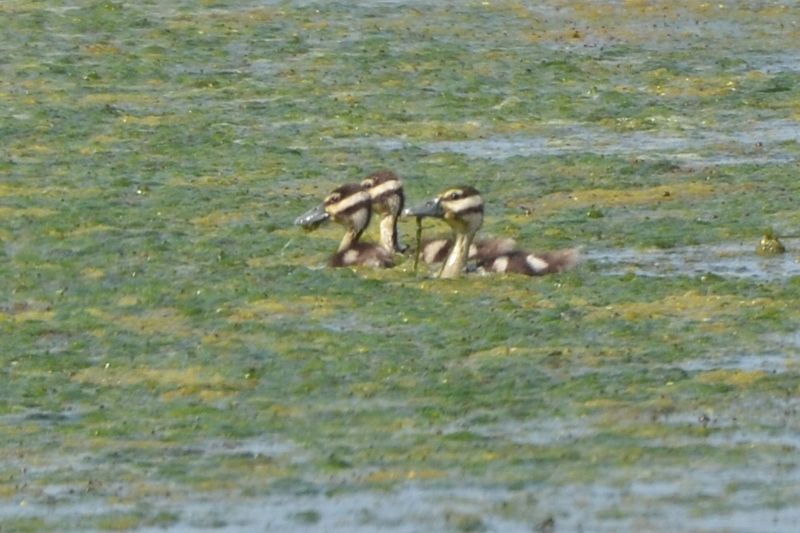 American Kestrels and Belted Kingfishers were seen and several families of Pied-billed Grebes were also seen including one family with very small chicks. As I passed a pair of feeding Sandhill Cranes they were began doing this little hopping dance. Probably not sure if they should flew or ignore me. Also ran into a mixed flock of small birds consisting of Palm and Pine Warblers, Gray Catbirds, Northern Cardinals, a White-eyed Vireo, Blue-gray Gnatcatchers, a Great Crested Flycatcher and a FOS House Wren. Best bird was a surprise in an American Bittern, which noisily leaped from concealment just as I was passing by. Doubt that I would have spotted it if it had stayed put. Soon the water levels will fall and we'll see more waders, spoonbills, ducks, harriers, kites, pelicans and shorebirds. Fall migration continues here in Southwest Florida with more good birds continuing to passing through our area. Several of us have been visiting the boardwalk at Six-Mile Cypress Slough Preserve looking for interesting birds. We usually do not expect the numbers seen at migrant traps in Tampa and Miami, but this season seems to be developing well. In the past week or so this venue was hosted a nice variety of warblers with thrushes showing up recently. This morning, the numbers seemed way down, but I did manage Chestnut-sided and Cape May Warblers. 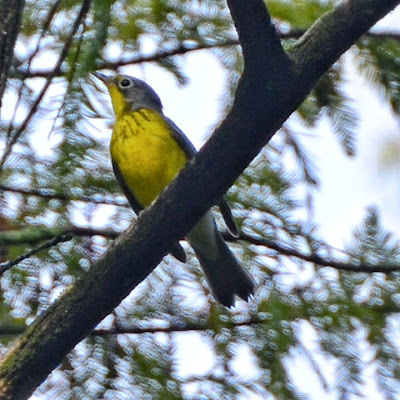 Yesterday was outstanding with our group of birders including Vince McGrath, Dr Jose Padilla-Lopez, Walt Winton and myself, getting great looks at a Canada Warbler, which is an uncommon bird in Florida. The birds seen included Hairy Woodpeckers, Scarlet Tanager, Summer Tanager, Veery, Swainsen's Thrush, Chestnut-sided Warbler, Ovenbird, Northern Waterthrush, Blackburnian Warbler, Black-and-white Warbler, Common Yellowthroat, American Redstart, Black-throated Blue Warbler, Yellow-throated Warbler, Chimney Swifts, Tufted Titmice, Ruby-throated Hummingbird, Red-eyed Vireo, Red-shouldered Hawk and Carolina Wren. Other birds seen earlier included Louisiana Waterthrush, Nashville Warbler, Prothonotary Warbler, Magnolia Warbler, Gray-cheeked Thrush and Baltimore Oriole. Hopefully we can enjoy additional snow birds passing through in the coming weeks. Of note was a friend of ours has spotted a Rufous Hummingbird hanging out in his neighbors yard and several of us have been to see it. Personally, I dipped on it as I had to leave for work. But Dr Jose did get a couple of photos after a couple of long waits. Back last Memorial Day weekend several of us had reservations for a pelagic trip out of Ponce Inlet sponsored by Michael Brothers and the Marine Science Center of New Smyrna Beach. As our caravan was crossing the state we received word that the trip had to be cancelled due to weather condition. Tropical Storm Beryl was churning up the coast. It was a disappointment, but we managed to turn lemons into lemonade due turning south to the Florida Keys and some great birding. This past weekend I was rescheduled to attend Michael Brothers' latest trip out into the Gulf Stream with hopes of adding a long list of expected pelagic species with the possiblity of some rarity to show up. As it was a four hour plus drive, I used a day to make the drive and have time to visit Merritt Island National Wildlife Refuge. Upon arrival I hurried to the Bio Lab Road first with the idea of locating a possible lingering Wilson's Phalarope that was being reported there. The lagoon side of the road was not very fruitful as the water was too deep for waders and shorebirds. The shoreline though offered looks at Sanderlings, Semipalmated Plovers, Black-belled Plovers, Least Sandpipers, Western Sandpipers, Semipalmated Sandpipers, Ruddy Turnstones, Double-crested Cormorants, Short-billed Dowitchers, several Stilt Sandpipers, Greater and Lesser Yellowlegs, a Black Tern a couple of Forster s Terns, many Laughing Gulls and the Wilson's Phalarope I was looking for. I actually missed the phalarope, but another fella, Lee Leatto, photographing the scene, put me onto the bird. Next I tried The Blackpoint Drive. Not much was here to see. Best wader was a Reddish Egret. 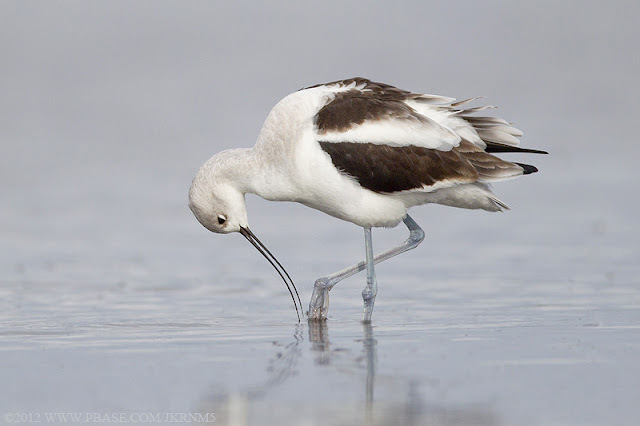 Shorebirds were limited mostly to Sanderlings and Black-bellied Plovers. Came across a nice gathering of Laughing Gulls and terns. Had Caspian, Royal, Forster's and possible common and sandwich Terns. lacking a scope made it difficult to discern some of the terns ID. ﻿The attendees for the pelagic trip needed to be at the dock at 3:30 am for a 4 am launch. We had fifty-three participants assembled with some folks having flown in from other states to attend the trip. Also met several folks I knew by name or reputation. Like Wes Biggs, Scott Simons, Roberto Torres, Danny Sauvageau, John Mangold and Andy Kratter. We boarded the Pastime Princess for our voyage.. Weather conditions were good, but the seas were a bit choppy for a while. Close into shore, as dawn was breaking we starting picking up a few birds. Cory's Shearwaters were the most commonly seen bird of the day. By the time we reached the weed line some 50 or so miles out we had Pomerine Jaegers, a single Greater Shearwater, Sooty Terns, Common Terns, Magnificent Frigetbirds and a number of land birds in migration including dozens of warblers, an Eastern Kingbird and several Great Blue Herons. At the tuna grounds the crew chummed the waters to try to lure in any storm-petrels. We surprisingly dipped on storm-petrels but did see as many as a dozen Black-capped Petrels. On the trip heading back to port we could add Bridled Terns too. Some folks got red-necked phalarope and Audubon shearwater, but I missed them. It was a good trip in that we did find some good birds, but expectations were high that we would manage a much longer list. Maybe next time. Other encounters included great views of a large pod of Atlantic Spotted Dolphins swimming with the boat and a gathering of 6 to 8 huge Leatherback Turtles. Sure wish my camera would have been working. It was a very long and sun-soaked trip. We arrived about 7:40 pm at the dock, were many weary and sun-burned birders departed for home. 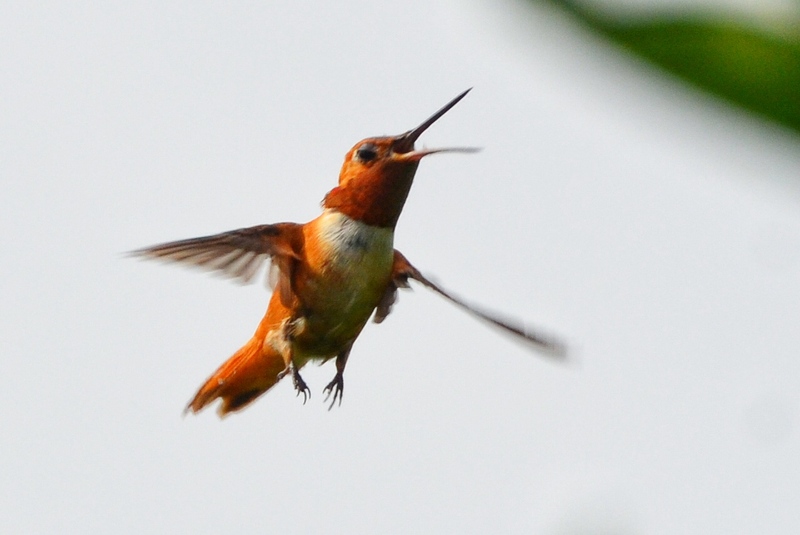 To see photos and stories from fellow birders on this trip, checked the hyperlinked sites above. After a very good night's sleep it was time to head for home. But I had a couple of stops in mind on the way. First was to stop at Joe Overstreet Road near Kissimmee State Park with idea of locating the Whooping Cranes that have taken up residence there. They are a part of the Florida non-migrating flock that we hope will one day be self sufficient. I arrived about 10:30 am and never did find the whoopers. Lots of Sandhill Cranes and several flocks of shorebirds on the sod farms including Pectrol Sandpipers, Black-belled Plovers and some Yellowlegs. I did also come across several Wild Turkeys ( should be Osceola subspecies), a couple of early Palm Warblers and found a pair of Kestrels. I'm not sure if they are migrants or resident Southern American Kestrels. The most interesting event here was the cattle round-up. Several ranchers on horse back with thier cow-dogs rounded up a herd of cattle in one pasture and moved them down the road to another pasture. The dogs were very instrumental in getting the cattle to cooperate. Later, at the Taylor Creek Water Management area I had a trio of Tree Swallows, a Bank Swallow and several Barn Swallows. I made a point of heading into the Everglades Ag Area south of Belle Glade with the idea of checking the sod farms and fields around Brown's Farm Road for any shorebirds or swallows. Best I got were a lot of Mourning Doves, Starlings, a few Barn Swallows and a couple of Eastern Kingbirds. That pretty much ended my birding weekend. 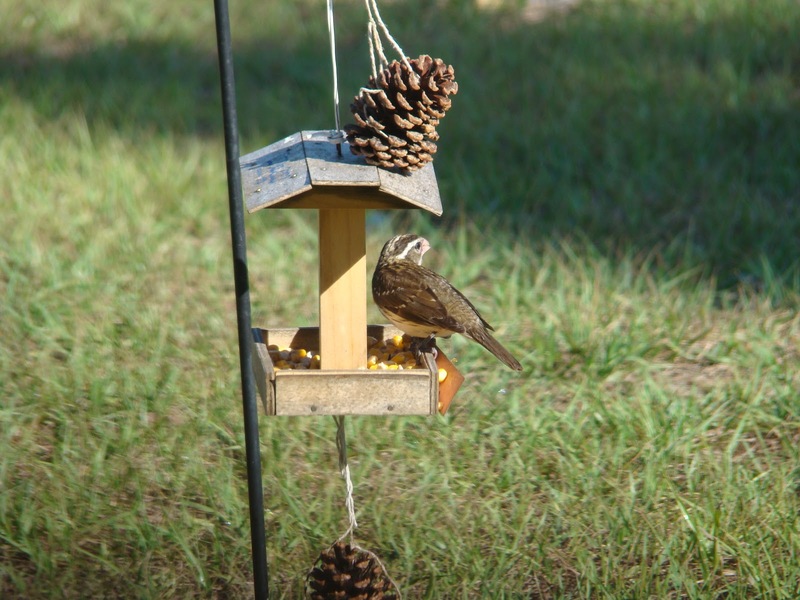 The Fall Migration is heating up here with the arrival of the neo-tropic warblers. Reports from the Miami and St Pete areas included lots of interesting birds such as Blackburian, Kentucky and Canada Warblers. Haven't heard anything from Sanibel Lighthouse yet, but Six-Mile Cypress Slough Preserve has yielded Blue-winged, Blackburnian, Tennessee, Chestnut-sided, Worm-eating and Hooded Warblers. So migration, which can be hit-or-miss in our corner of Florida, is becoming interesting. At Harns Marsh in Lehigh Acres, were I stopped by for a quick visit before heading into work, I found the water is still too high for waders and shorebirds. 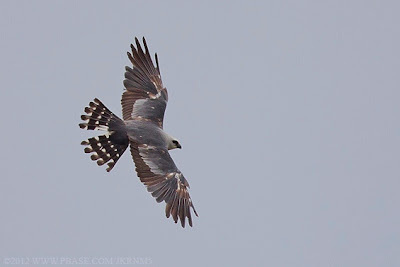 I've dipped on snail kites for several weeks know as they appear to have left the marsh, first due too very low water levels and now because of very high levels, in their search for their favored meal of apple snails. Still no kites seen but a few Limpkins are still present. Best bird of the day were a flock of migrating Bobolinks resting in the weedy berm. First heard their distinctive 'pink pink' call and checked them closely as they all were in their drab basic plumage. I do believe that about all of my local birding associates are active in the Lee County Bird Patrol. They volunteer to conduct bird surveys at least monthly on Lee County preserved properties. at 6-Mile Cypress Slough Preserve. It was logical to join them as I am doing the work anyway. For now I will be added as one of the monitors at Harns Marsh, were it has been fairly quite these days. But as the rainy season soon subsides the bird population should grow. One interesting development is that an adjoining county preserve - West Marsh - has been found to have a breeding population of Bachman's Sparrows. A new county bird for me. Bird Patrol members Dr Padilla-Lopez and Gayle Sheets had successfully confirmed their presence on their preliminary survey of the property. The Bird Patrol monitors the bird life at most all of Lee County's parks and preserves such as Bunche Beach, Lakes Park, 6-Mile Cypress Slough and many other properties. My being processed into the Bird Patrol was not hindered by our coordinator, Gayle Sheets, being on an extended vacation out West. When asked about any interesting sitings, she responded with Elegant Trogon, Spotted Owl and Violet-crowned Hummingbird in Arizona. Plus Grizzly Bear and Rocky Mountain Goat in Glacier National Park. Someday, probably after retirement I will head out that way too. But for now its watching the happenings here in Lee County. A great place to bird. 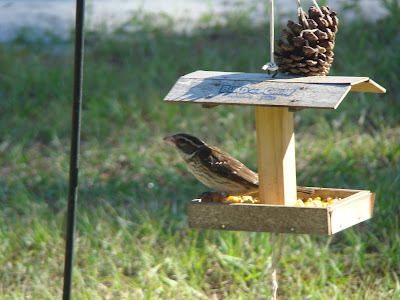 If you are unfamiliar with birding here, please check out the Lee County Bird Patrol website. Its very informative.. The early migrants are finally arriving in beautiful Southwest Florida and specifically at our local patch called Six-Mile Cypress preserve. We have already seen the arrival of the shorebirds and now that the warblers are at hand. Wednesday I had the opportunity to spend a few hours biding in the company of Walt Winton. We both had read Dr Padilla's report from a couple of days ago about how much the birding had improved. He had reported Short-tailed Hawks, plus Hooded, Worm-eating, Pine, Northern Parula, Louisiana Waterthrush,Yellowthroated and Black-and-White Warblers, plus Red-eyed and Yellow-throated Vireos. We started out with a Prairie Warbler in the company of Tufted Titmice, Carolina Wrens, Blue-gray Gnatcatchers and Red-eyed Vireos. Waders were notability absent due to the high water levels and we dipped on the short-tailed hawks. but we have a number of Chimney Swifts whom I presumed were also migrating through. Now back to the warblers - we came up with eight on the day including Hooded, Black-and-White, a Prothonotary, a Yellow, a Northern Parula, a half dozen American Redstarts and some Pine warblers. We also found Pileated, Hairy, Downy and Red-bellied Woodpeckers, more Red-eyed Vireos, a Great Crested Flycatcher, Belted Kingfisher, Anhingas and a Blue Jay. Seems other birders present reported worm-eating warbler, a kentucky warbler and louisania waterthrush. A nice start for the fall migration. An enthusiastic group of about 30 people assembled at Bunche Beach for a Bird Walk sponsored by the Lee County Bird Patrol. The walk was lead by Walt Winton and Charlie Ewell and was indeed a success, despite the heat and threat of lightening. Many of out spring shorebird migrants were on hand. Best birds were found while sorting through the Sandwich Terns resting on the exposed sand bars were a Common Tern and a Gull-billed Tern were found. Unfortunately we were unable to find any black terns. They usually show-up at this location just before Labor Day. Other terns present included a lot of Black Skimmers, a few Royal Terns and about a dozen Least Terns. 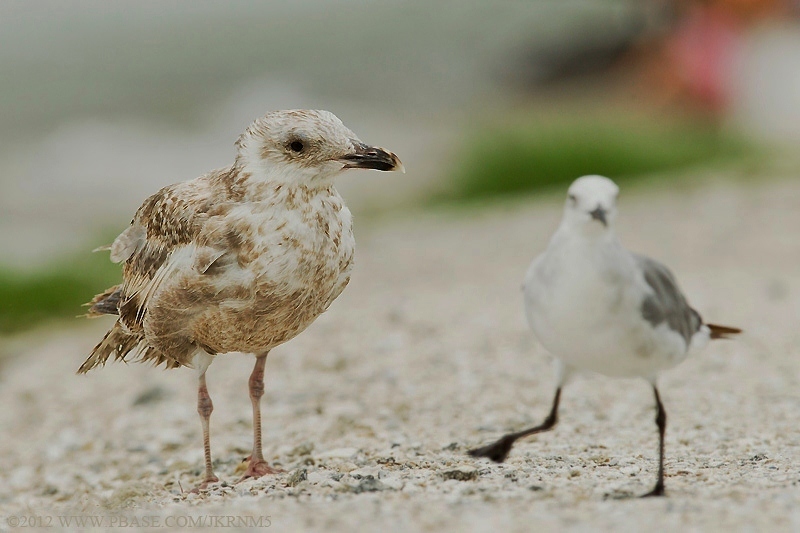 Laughing Gulls were the only expected gull species this time of year. We did search for the long-billed curlew sometimes seen here. Dipped on it but did see Willets, a Marbled Godwit, Ruddy Turnstone, Short-billed Dowitchers, Black-bellied Plovers, a couple of Piping Plovers, several Semipalmated Plovers and a Wilson's Plover. Western and Least Sandpipers, and Sanderlings were seen along with several Roseate Spoonbills and White Ibis. Both a normal red Reddish Egret and a white-morphed Reddish Egret were seen. Barn Swallows are the most prevalently seen swallows these days and a couple made an appearance. So did a Belted Kingfisher. A juvenile Bald Eagle was spotted far off dining on the beach. Figure that it had hung around instead of wandering off as the eagle population will do after nesting is over. We did miss a few interesting species like the curlew. we did not see any oystercatchers, spotted sandpipers or night-herons and the black terns didn't show either. A week ago Yellow Warblers, White-eyed Vireos, Prairie Warblers and the Long-billed Curlew were seen, but again, not today. 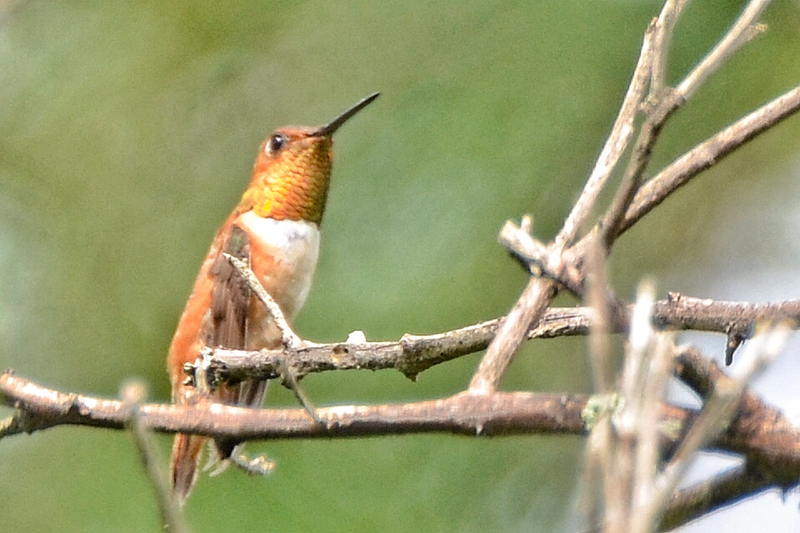 Fall migration is diffidently begun as, recently, we have begun finding early fall migrating birds like Black-and White Warblers, American Redstarts, Louisiana Waterthrush and Red-eyed Vireos at Six-Mile Cypress Slough Preserve. The shore birds have been increasing here as well with arrival Marbled Godwits, Short-billed Dowitchers, Spotted Sandpipers and Piping Plover. But in late July till about Labor Day the venturing to the Everglades Agricultural Area in Palm Beach County south of Belle Glade can offer good observation of migrating shore birds, terns and swallows. Today five of us headed out before dawn to look for these migrants. Our crew included Dr Jose Padilla-Lopez, Master Birders Vince McGrath and Vince Lucas, Stan Damen and myself. The first stop was at the sod and rice fields at the King Ranch along US 27. We quickly tally a FOS Belted Kingfisher, Ospreys and Red-shouldered hawks on the wires along the road, nineteen Upland Sandpipers in the sod fields with, hundreds of Barn Swallows, a number of Cliff Swallows, dozens of Pectoral Sandpipers and Killdeer, about seventy Black-bellied Plover which had to be carefully scanned for any possible golden plovers, a trio of Sandhill Cranes flying in the distance and a surprise of a Burrowing Owl having made itself a home in the sod. At the rice fields were huge numbers of Black-necked Stilts, Fulvous Whistling Ducks, Lesser Yellowlegs, Glossy Ibis and Short-billed Dowitchers. 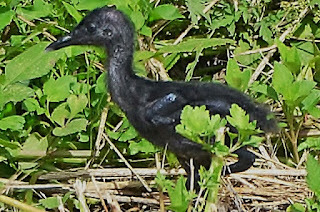 Several Stilt Sandpipers and a very nice surprise of a King Rail with its black-colored fluffy chick. Across the highway in a flooded field were seen a great quantity the shorebirds including Short-billed Dowitchers, Greater and Lesser Yellowlegs, Pectoral Sandpipers, Stilt Sandpipers, Black-necked Stilts, Least Sandpipers, Semipalmated Sandpipers, Killdeer, Ruddy Turnstone, Cattle Egrets, Great Egrets, Black-bellied Whistling Ducklings, several Black Terns and Gull-billed Terns and more Barn Swallows and Common Nighthawks. From here we turned west onto CR 827 to its terminus at Bolles Canal and the Barn Owl roost. We only had a very brief glimpse on a single flushed Barn Owl, but we added a lone Swallow-tailed Kite and Black-crowned Nightheron. Following lunch in Belle Glade we headed over to nearby Torry Island to re-find the Orchard Orioles Vince Lucas had seen on an earlier trip here a couple of days ago. At the flag weed we did see the oriole family including a male and a pair of females. But as we were scouting for these birds we noticed a pair of immature Purple Galluniles walking the end of the flag weeds. Then came a nice adult followed by four dark colored baby purple galluniles and a second adult. Then came a pair of FOS Eastern Kingbirds in the company a pair of fussing Northern Mockingbirds. As we were leaving for Brown's Farm Road, ten Northern Rough-winged Swallows were seen settling on the wires. At the flooded fields near Brown's Farm Road were located hundreds of wading birds, shorebirds, terns and nighthawks. Here we added a lone American Avocet, but dipped on the wilson's phalarope Vince Lucas found here a few days ago. There had to be a hundred Black Terns in the company of some Gull-billed Terns and Black Skimmers. 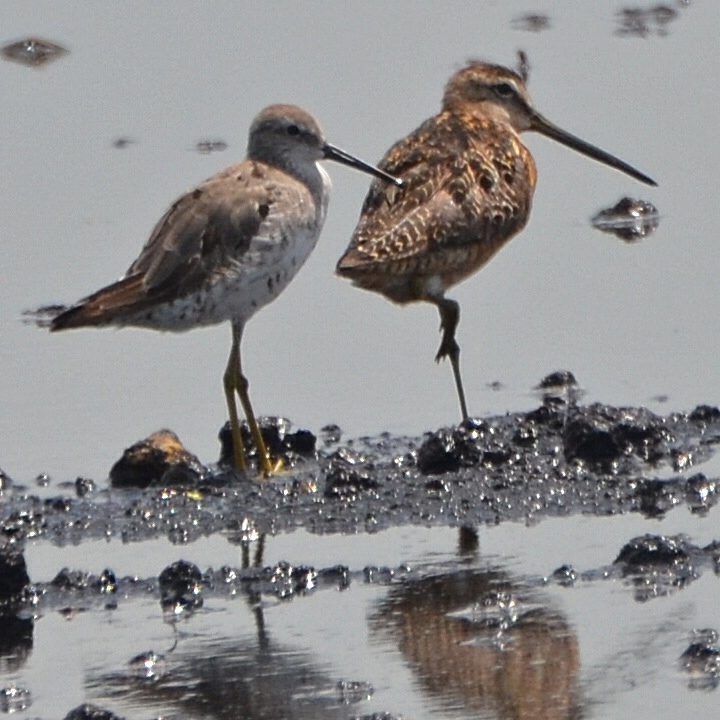 There were many Short-billed Dowitchers, Greater and Lesser Yellowlegs, Pectoral Sandpipers, Stilt Sandpipers, Killdeer, Semipalmated Plovers, Western Sandpipers, Least Sandpipers, Semipalmated Sandpipers and Black-necked Stilts. The wires along Brown's farm Road were checked for miles for any swallows. Surprising we dipped on swallows, but saw concentrations of Common Nighthawks, European Starlings and Brown Cowbirds. Our final destination was along Belle Glade Road were the flooded fields were continued with many of the same species. We did add our first Roseate Spoonbills and a few more Black-bellied Whistling Ducks. One bird stopped us for a closer look. At first glimpse we though perhaps we encountered our first wood stork, but it turned out to actually be a huge over-sized White Ibis with a dirty neck and head, This bird intrigued us enough to even consider it as a cross between a sacred ibis and a white ibis. But that was easily dismissed too. This trip was diffidently a success with locating so many upland sandpiper, king rails, orchard orioles, the purple gallunile families and barn owl. We did dip on the wilson's phalarope, solitary sandpiper and wood storks. Dr Jose Padilla-Lopez, Master Birder Vince McGrath and retired engineer Stan Damen joined the with thirty-five fellow birders aboard the Pastime Princess to bird for pelagic bird species out on the Atlantic Ocean. Michael Brothers of the Marine Science Center had sponsored this trip out of Ponce Inlet, Florida. My interest was vicarious in that I can not attend but really would have enjoyed the event. 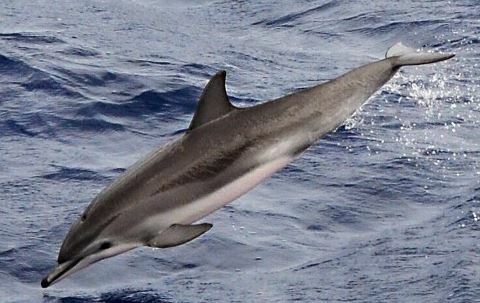 His report includes background on the Clymene Dolphin sighted today. This is a rarely seen and a lifer observation for everyone aboard the Pastime Princess. Reddish Egret, Roseate Spoonbills, Greater and lesser Yellowlegs, Least Sandpipers, Stilt Sandpiper, Short-billed Dowitchers, Least Terns, Gull-billed Terns, Black Terns, Forster's Terns, Royal terns and Black Skimmers. On Monday's return trip to ft Myers they visited Joe Overstreet Road near Lake Kissimee in the hunt for Whooping Cranes, which were seen. 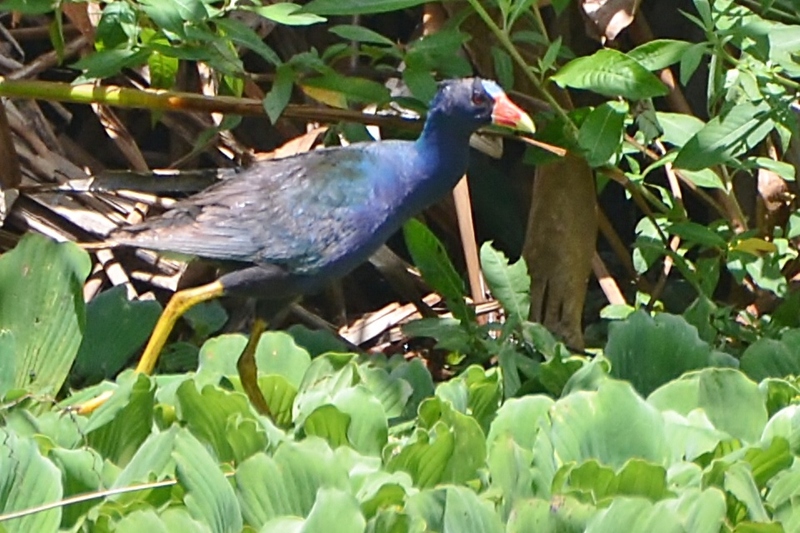 Also sighted were Northern Bobwhites, Wild Turkeys, Bald Eagle, Sandhill Cranes and Purple Gallinules. Teamed-up with Bob Pelkey for a Big Day. Our goal was to try to reach a 100 count day concentrating our efforts in Central Florida. We left Ft Myers at 5 AM and made our first stop of the day around seven at The Celery Fields in Sarasota. The location was over-grown and the berms were in a need of mowing. The grass was very tall and wet. The birding was not too bad. We collected twenty-five species including Wood Ducks, Black-bellied Whistling Ducks, Common Gallunile, Barn Swallows, Ospreys, Laughing Gulls, Sandhill Cranes, Red-winged Blackbirds, Limpkins, and Brown-head Cowbirds. Our best birds here were a Least Bittern that was nice enough to fly past us twice and a Purple Gallunile busy working the marsh foliage for breakfast. We had a nice start with the Celery Fields. 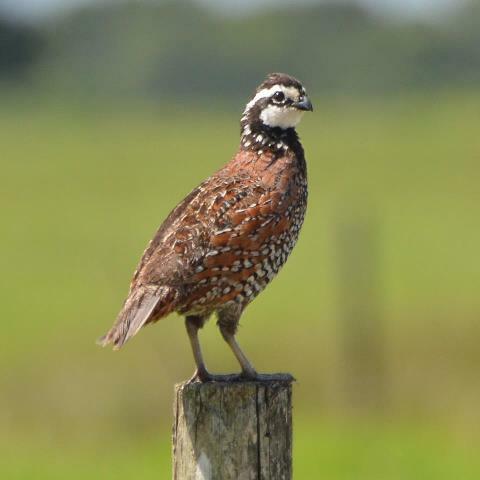 July is not one of the best months for birding in Florida and that was one of the reasons we headed north to look for birds we do not see in south Florida this time of year. So next we stopped at Cockroach Bay Preserve in Hillsbourgh County were I hoped to find gull-billed terns. As we entered Cockroach Bay Road we started with a Gray Kingbird. The mitigation ponds were grown over and offered very little activity. We checked the sod fields and found lots of Laughing Gulls, Black-bellied Plovers, Killdeers, White Ibis, Grackles and Starlings. 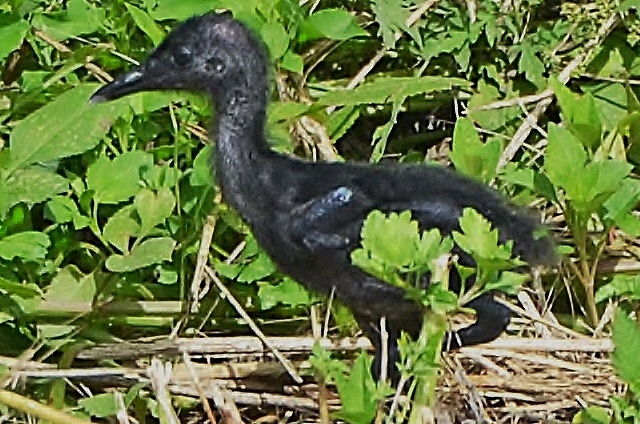 At the ponds in the Cockroach Bay Preserve we added Wood Storks, Least Terns, Black-bellied Whistling Ducks, Roseate Spoonbills, Black-necked Stilts, White Ibis, Glossy Ibis, a trio of Black Skimmers and the best best bird was FOY Black Tern. Next was Lettuce Lake Park in Tampa. The location can be a good location from Prothonotary Warbler and yellow-throated vireos.. We were informed by several people upon our arrival that a barred owl was easily seen along the boardwalk. We did have very close views of a juvenile Red-shouldered Hawk and observed several waders and Limpkins. Our best birds were Northern Parulas, a nice male Prothonotary Warbler, that poor Bob never did get to see or photograph even when it flew behind his head, several Red-eyed Vireos, Tufted Titmouse, Carolina Wren, Carolina Chickadee, Blue-gray Gnatcatchers, Yellow-throated Warblers and Prairie Warbler. But we dipped in the yellow-throated vireo and the barred owl. Even with a light rain we headed to the nearby Croom Tract of the Withlocoochie State Forest and stopped at the intersection of Croom Rital Road and Rock Lake Road were we added Great Crested Flycatcher, more Bobwhites and Carolina Chickadees. Had lots of Blue Jay, more nesting Red-headed Woodpeckers, Black-and-White Warblers, a singing Eastern Towhee and a pair of Pileated Woodpeckers. Had hoped for summer tanager and acadian flycatcher, which I have seen here before but dipped on these. Our final stop was Ft Desoto Park in Tampa Bay. The rain had let up by now and we ended up spending a couple of hours here mostly after shore birds. It is evident the Tropical Storm Debbie had made a few changes to parts of the shoreline, but it didn't seem too bad. Saw several dozen Magnificent Frigatebirds and Laughing Gulls. Also added Least Tern, Sandwich Terns, Royal Terns, Wilson's Plovers, Brown-headed Cowbirds, Gray Kingbirds, Loggerhead Shrikes, Willets, Semipalmated Plovers, Marbled Godwits, Short-billed Dowitchers, a lone Red Knot, Lots of Ruddy Turnstones, some Sanderlings, Black Skimmers and a trio of FOS Least Sandpipers. So its almost dark by now and time to head for home. A good day with some good birds. We didn't get to a hundred birds, but managed to reach eighty-nine. Not bad for July. Today I took a few hours to hit some sites to start a new month list for July. Started at nearby Harn's Marsh were Snail Kites and Limpkins can be counted on as sure hits. But in a reference to a recent article in the Ft Myers News-Press the local snail kite population has been suffering from the recent drought conditions. Its been reported that all of the recent snail kites nests have failed and they are migrating up towards Kissimme in search of a dependable food supple. On this visit I found the water levels are rising due to the rains from tropical Storm Debbie, but still the marsh was no very birdy. I did see a couple of Snail Kites and a few Limpkins. With the high temperatures I did not stay long and as I returned to my car I noticed that the new Harn's Marsh Middle School's retention pond was loaded with birds. Counted at least nine Black-necked Stilts, plus numbers of Mottled Ducks, Glossy Ibis, Snowy Egrets and a lone Roseate Spoonbill. Next I checked out the activity at the Franklin Locks on the Caloosahatchee River. Noticed that the purple martins had moved on from the martin houses, but House Sparrows were abundant. A Bald Eagle was setting atop the nest tree across the river and a a Yellow-crowned Night-heron was a sentry duty at the beach. Least and Forster's Tern were actively feeding around the lock. From here I headed across the river at Alva and traveled west along North River Road looking for any caracaras. Did not get the caracara, but added a White-eyed Vireo. On the north side of Cape Coral I found a couple of the resident Florida Scrub Jays, Eastern Meadowlarks and Burrowing Owl. lastly at a stop at the ball fields on Pelican Boulevard in Cape Coral I added more Burrowing Owls, Monk Parakeets and Eurasian Collared Doves. Had to end this trip for now as I had to head into work soon. But I managed to add a few more birds on the way into work including Eastern Bluebird, Red-shouldered Hawks and Common Nighthawks. Lastly we had our nightly visit from a Barred Owl. A nice variety of birds today. from the Atlantic side of Florida off pelagic species being observed on-shore due to prevailing winds. Well, even though we see far fewer pelagic species, the potential for finding pelagic species on-shore on the Gulf of Mexico side of Florida are increased due the presence of Tropical Storm Debbie sitting off-shore. We have experienced lots of rain, heavy winds, flooding and beach erosion due to T. S. Debbie and a few scattered reports of pelagic have been coming in. Primarily north of us. Reported were jaegers, a brown noddy and several sooty terns. So on Sunday I headed out in the rain for Bunche Beach. Arriving about 9:30 the rains had subsided for now, but the winds and waves were still quite high. Not much beach was visible and only a few shore birds were present including a Willet, a Black-bellied Plover, a couple of Ruddy Turnstones, a pair of Least Terns, a very wet Red-shouldered Hawk and a Laughing Gull. Then waves of Magnificent Frigatebirds appeared from the north and very slowly floating on the winds along the shore, heading southerly. Had several soaring, almost hovering on the winds just three feet above my head. Alas my camera is broken so I missed on some great photo opportunities. I had counted thirty-three plus Frigatebirds and after an hour and a half I left to met up with Bob Pelkey on Sanible Island. Before Going to Sanible I stopped at Bowditch Point Park on Ft Myers Beach, were I found a trio of Red Knots, Black Skimmers, Wilson's Plovers, Semipalmated Plover, Black-bellied Plover, Ruddy Turnstone, Willets, Pelicans, Least Terns, Laughing Gulls, Sandwich Terns, Royal Terns, Sanderlings and a Gray Kingbird laying low from the winds. We made stops at Sanible Lighthouse and Bowman's Beach were all we could really see were heavy surfs and few birds. At Blind Pass the best birds were a Sandwich Tern, a trio of Chimney Swifts and a family of Red-bellied Woodpeckers. We dipped on any real pelagics. One interesting observation were some para-sailing adventurers at Blind Pass, who, I my mind, were risking serious harm in such powerful surf and winds, Several times we noticed the para-sailors totally lifted off the surf by five to ten feet, very close to a rock jetty. On the Sanibel Causeway we encountered more Frigatebirds, more laughing Gulls and an out-of-place Herring Gull. I had not planned on doing any birding today, but late on this Tuesday afternoon I had dropped my daughter off in Bonita Springs, but did bird nearby Ft Myers Beach. Radio news reports had described severe damage on Ft Myers Beach due to T. S. Debbie including Little Estero Island were the Least Tern colony was nesting. So as an after thought I did drive over and found that much of the nesting colony site at the south end of the beach was flooded. No doubt the storm conditions would have been detrimental to any eggs or young of the least terns, snowy plovers or wilson's plovers still nesting here. Did see many more Magnificent Frigatebirds including a female who was harassing the gulls and terns laying-low on the sands. Other birds seen included Least Terns, Royal Terns, Laughing Gulls, Black Skimmers, an American Oystercatcher, Wilson's Plovers and Ruddy Turnstones. Next I rechecked Bowditch Point Park at the other end of the Ft Myers Beach. Even with the winds still blowing hard there was a seaside wedding taking place on the beach. Other sightings here were a lone Snowy Plover, several Wilson's Plovers, several Laughing Gulls, Black Skimmers, Royal Terns, Least Terns, Sandwich Terns, a lone Common Tern, a lone Forster's Tern, and a very out-of-place Ring-billed Gull. On these two days I didn't find any pelagic species, but did have some good birds just the same. The summer months are not the best time to bird in southwest Florida. 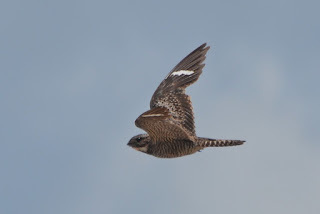 The migrants have passed on through, the winter visitors are gone and several shore bird species disappear, as they return to the Far North for breeding. So with the reduced number of species and the heat of summer, birding can be a bit frustrating for next couple of months. But interesting birds are still around. Last week I headed over to Little Estero Lagoon on Ft Myers Beach to visit the Least Tern nesting area. We have hundreds of nesting least terns on hand and I also located almost a dozen Snowy Plovers with several chicks and far more nesting Wilson's Plovers. One surprise was a dozen resting Red Knots, plus Royal and Sandwich Terns, and a soaring Magnificent Frigatebird. Also had a few non-migrating Black-bellied Plovers, Sanderlings and Semipalmated Plovers. The wires along Estero Boulevard also hosted four Gray Kingbirds. On recent visits to Bunche Beach in June I had a late and LIFER White-rumped Sandpiper, a Whimbrel, Royal Terns, Sandwich Terns, Least Terns, a pair of Gull-billed Terns, American Oystercatchers, some late Dunlins, Semipalmated Sandpipers, and several Short-billed Dowitchers. Plus Ospreys, Bald Eagle, Willets, a Lesser Yellowlegs, Roseate Spoonbills, Brown Pelicans, both Night-herons, Reddish Egrets, Black Skimmers, Purple Martins, Mottled Ducks, White-eyed Vireos, and Prairie Warblers. 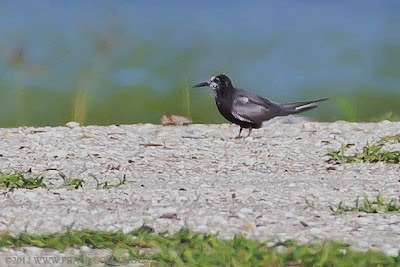 Out on Cayo Costa Island, Charlie Ewell also had the Gull-billed Terns and a Black Tern. A visit to Babcock-Webb in Charlotte County, I easily located nesting Red-cockaded Woodpeckers, a couple of, still singing, Bachman's Sparrows and several Brown-headed Nuthatchs. Plus Anhingas, Common Nighthawks, Eastern Meadowlarks, Loggerhead Shrikes, Northern Mockingbirds, Eastern Bluebirds, Eastern Towhees and Pine Warblers. Also a bobcat. At Hicky's Creek Park I added Red-headed Woodpecker and Chimney Swifts. In Cape Coral we had Florida Scrub Jays, Burrowing Owls, Monk Parakeets and Eurasian Collarded-doves. 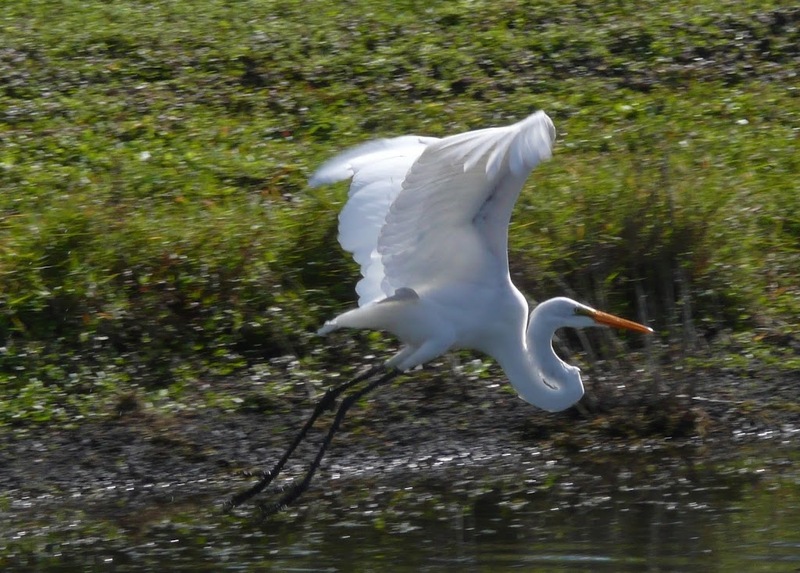 At Okaloacoochee Slough we added Northern Bobwhite, Wild Turkey, Swallow-tailed Kites, Red-bellied Woodpeckers, Red-shoulder Hawk, Great Crested Flycatcher, American Crow and more nighthawks. Barred Owls are regular visitors at my work place and White-winged Doves and Brown Thrashers are seen around my home. Snail Kites and Limpkins are still easily found at Harn's Marsh.